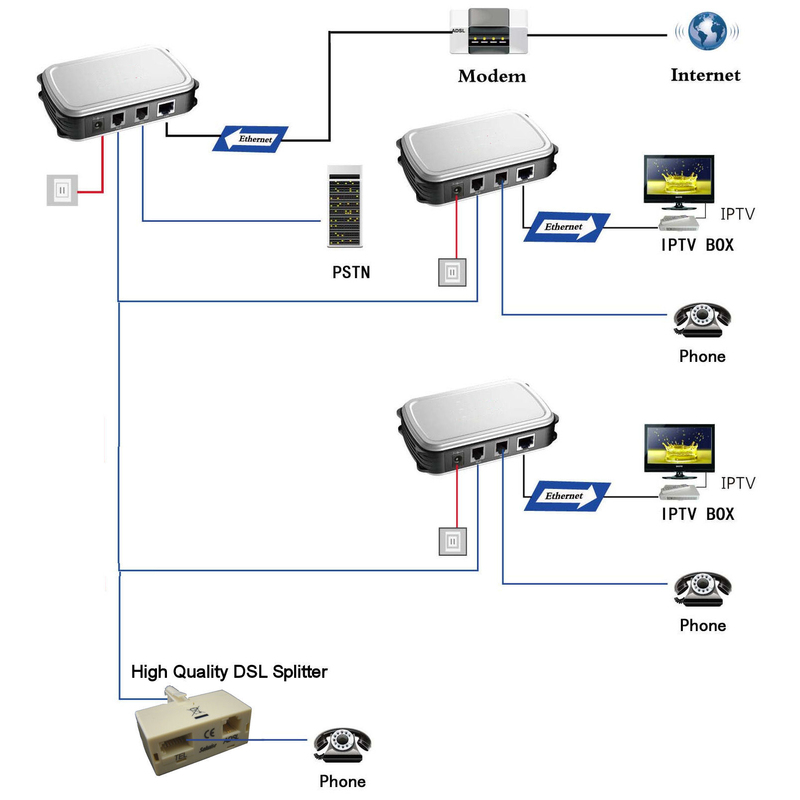 What is Homeplug over Twisted Pair? Traditional Homeplug is a method of transmitting network data down standard mains powered cables. So the network data is overlaid onto the mains signals. Typical applications are networking around the home via the mains sockets. This is the application of Homeplug that 99% of people are familiar with. However, it is also possible to send Homeplug signals down other cable types; the Homeplug technology is flexible and independent of the cable type or the infrastructure used for the transport of the signals – you just need to make sure that the product has the necessary hardware interface specific to the type of cabling or transport infrastructure you want to use the units on. So with the correct hardware interface on the Homeplug units you could, for example, use Homeplug networking down coaxial cable or standard twisted pair wire. The advantages of Homeplug over more dedicated cabling, compared to over active mains cables, are much higher data transmission rates and longer cable runs. The electrical noise invariably present on normal mains wiring and the complications present in how the cable is distributed (spurs, consumer units etc) often limits the effective data speed and also restricts the length of cable runs you can get away with. Homeplug over, for example, twisted pair wire can give TCP data throughputs in excess of 25Mbps with cable runs of 500m. So why would you want to use Homeplug over twisted pair wire as a system for data transmission instead of normal network CAT5 infrastructure? Well there might not be an existing lan cable run in place but there might, for example, be a telephone wire between the points. Telephone wire is twisted pair wiring and is therefore ideal for this type of technology. Twisted Pair Homeplug can easily be used over telephone wires even if the telephone wires are being used for telephony! Because the Homeplug signals operate at much higher frequencies (in the range 2-68MHz) they can operate down the wire even when it's simultaneously being used for telephone calls: All you need to do is use a simple 'splitter' (much like a normal ADSL splitter) to separate out the telephone signals from the Homeplug signals. In fact the Twisted Pair Homeplug units have a built in splitter for just the reason. There's a port for the telephone connection and then a port which is used to carry both the telephone and Homeplug signals. Simply plug the telephone (or the telephone line) into the filtered port on the Homeplug device and then use the data port for connection to the twisted pair being used for the data transmission. So Twisted Pair Homeplug can just as easily be implemented on active telephone wires or unused wires for example an unused wire pair in the telephone cable or an unused pair present in cables used for connectivity in a burglar alarm set-up. Another reason to use Twisted Pair Homeplug is the ability to handle considerably longer cable runs whilst still delivering acceptable performance. Twisted Pair Homeplug will typically work on cable runs up to 1.5Km though, in practice, the maximum length should be taken as less than 1Km (where, in our tests, we found the data throughput had dropped to single figures). However Twisted Pair Homeplug delivers perfectly good data throughput at cable distances right up to 500 or 700m whereas standard CAT5 cabling can only be used at up to 100m. Above illustrates a typical wiring layout. In this example the twisted pair wire used is an active telephone wire which has three extensions running from the same PSTN (phone) line. In this example (this might be distributing the internet to several rooms in a large house) the first Twisted Pair Homeplug unit takes a network cable from the internet source modem/router. In this example this happens to be at the same point where the main telephone line comes in (as it often will be where the broadband is coming as ADSL over the main phone line) so the telephone line connects to the TEL port on the Twisted Pair unit (if this IS a phone line which carries ADSL then you need to ensure that the phone line connection is made through a DSL splitter). Then the wiring to each telephone extension connects via the PLC port on the Homeplug device. At each extension, to convert back to a network and phone connection you connect the active telephone wire to the PLC port. The telephone at the extension connects to the TELK port and the network connection to the LAN port. If you have an extension where you want to connect a phone to the active line but don't need a network connection (so the expense of installing a Twisted Pair Homeplug unit would be a waste) then a quality DSL splitter (note the word 'quality') can be used to isolate off the telephone signals from the extension wire (as illustrated above).